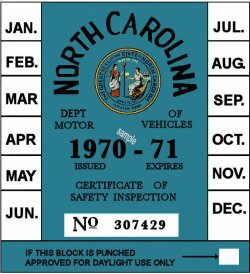 1970-71 North Carolina INSPECTION Sticker - $20.00 : Bob Hoyts Classic Inspection Stickers, Add a Final Touch to your Restoration! This 1970-71 NC sticker is an exact reproduction of an original we have in our archives. This beautiful 1970-71 North Carolina sticker was created and restored directly from an original. It was issued in 1970 and expired in 1971.